The Honored Alumni Award is the highest honor bestowed upon Cal Poly alumni by the University’s Alumni Association. The award was established by the Association to provide recognition for outstanding graduates and former students of Cal Poly. One Honored Alumni Award recipient is chosen every year alumni from the University’s seven academic colleges: Agriculture, Food and Environmental Sciences; Architecture and Environmental Design; Education; Engineering; Liberal Arts; Orfalea College of Business; and Science and Mathematics. The Cal Poly Alumni Association presents the Distinguished Service Award annually to an alumnus or alumna who has demonstrated exceptional service to Cal Poly and the Alumni Association. Awardees are honored each year during Homecoming at the Honored Alumni Banquet. Phil Serna earned a Master of City and Regional Planning degree from Cal Poly in 1994 after graduating from California State University, Sacramento. 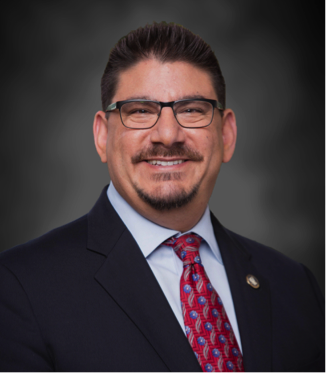 Serna is currently serving his second term on the Sacramento County Board of Supervisors and was re-elected to a third term in June 2018. In addition to his service as a Supervisor, Serna participates on many other boards and commissions, including chairing the Sacramento First 5 Commission and serving on the boards of Sacramento Regional Transit and Sacramento Library Authority; just three of the 30+ to which he commits time. In 2013 Governor Jerry Brown appointed Serna to serve as the first-ever Sacramento delegate to the California Air Resources Board. He was unanimously confirmed by the Senate Rules Committee one year later. Serna is a Sacramento native and the son of Sacramento’s first Latino mayor, the late Joe Serna Jr. Among his many priorities, Serna continues to work tirelessly protecting the American River Parkway, improving residents’ quality of life in some of the region’s most economically challenged neighborhoods, and reducing childhood health disparities countywide. Serna lives in Sacramento with his wife Roxanna Recinos-Serna (Architecture, ‘94) whom he met on a Cal Poly field trip, and to whom he credits the love and support necessary to do what he does for his home community. 1988 M. John Vickerman, Jr.